Soon after the formation of the Royton Local History Society the committee decided that it needed a high profile project to establish itself firmly into the fabric of the town. A light hearted suggestion of "Let's dig up Royton Hall" from Father David Booth of St. Paul's Church was taken up and the "Royton Lives Through the Ages" group was formed. The aim of the group was to literally dig into Royton's past. They began by excavating the site of Royton Hall. The history of the Hall is described in the Royton Hall page on this site so further explanation here is unnecessary. Frances Stott, Jack Wild, Jess Wild. After the two successful excavations carried out in 2005 and 2006 the discoveries were so interesting and intriguing it was decided that a third excavation would be made in 2007. It was decided at this point that it was too much work for the normal Committee members so a separate Committee was created purely to deal with the project thereby leaving the main Committee to continue with the normal day to day running of the Society. The members of the new Committee are listed below. In November 2002, at the recently formed Royton Local History Society’s November meeting, Father David Booth of St Paul’s Church, responding to Chair, Doug Ashmore's request for ideas, proposed that "we dig up Royton Hall’ with the Time Team. It was voted on and passed unanimously. A sub-committee was formed to take the idea forward and Robina McNeil, County Archaeologist, contacted. Once it had been established that Oldham Metropolitan Borough Council Parks and Open Spaces, who were responsible for the Hall site, had no objections, the Committee then began to look for funding for the project. A bid was made to the Local Heritage Initiative, and Voluntary Action Oldham’s Community Chest and Shaw and Royton Area Committee also provided funds. Funds were also raised from a variety of sources including local businesses and local groups and organisations to whom members of the Committee had given talks. Kiers North West who were building the new Library and Life Long Learning Centre in Oldham and more recently the new Radcliffe School in Chadderton, offered to provide fencing and cabins for the site. Royton Hall was the home of the Byron family until 1622 when they sold it to the Standish family. Although no date exists for the first building of a Hall in Royton, it could date back to the early days of the Byron’s ownership in the 13th century. In the 18th century it was altered and extended by the Percival family who were then the current owners. The Hall then passed by marriage to the Radcliffe family (formerly Pickfords) who owned it until the 1920s when it was sold to Dr Godfrey. At many times in its existence it was leased to a variety of families before finally being condemned and demolished in 1939. Although the original idea of digging up the Hall had involved Time Team, the Committee decided against a 3-day excavation and instead have two digs which would include the whole community including school children. Consequently the University of Manchester Field Archaeology Unit was approached to undertake the excavation and they made three trial trenches in October 2004 to establish if an excavation of the site was feasible. Once the necessary funding had been obtained, local schools were contacted and each invited to send a class of children. A call went out for adult volunteers as well. The first year’s excavation finally got underway in the summer of 2005. An excavator was used to strip away the top surface and a lot of the rubble from the inside of the cellars. Ten classes of children visited the site for half a day each. They not only learnt about the techniques of digging but also the need to wash and record any finds made. They also took part in a historical quiz round Royton. One teacher reported that her class had not slept the night before as they were so excited about the proposed visit. The excavation over the following two weeks was undertaken by the adult volunteers who excavated the deeper sections of the Hall eg part of the east wing, courtyard and the spectacular mid 16th century spiral staircase, unusual for its time, a throwback to stairways normally found in castles rather than a hall. The 2006 excavation was extended by a week to provide a longer period of time for the children to dig. This year saw the re-excavation of the courtyard, spiral staircase and the central section of the south front. Unlike the previous year a substantial amount of pottery was discovered including shards of 13th and 14th century pots, the earliest indications of settlement on the site. In 2007 funding towards a third excavation were raised from the National Lottery ‘Awards for All’, Asda and Royton Community Council. As funding was not obtained until May, the excavation did not take place until Sept – Oct as the Archaeology Unit was unavailable until then. This was perhaps fortunate in view of the weather, as had the excavation taken place at the usual time in the summer the site would have been waterlogged. 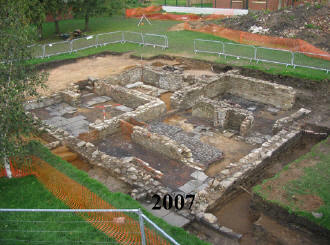 The excavation in 2007 focused on the west wing of the Hall, which had been built in the 18th century, and the rear north-east porch area which was suitable for the children to work in. The west wing revealed more cellars, each with a different type of flooring, ranging from stone flags, to handmade bricks and cobbles. A substantial staircase was also revealed. Meanwhile the porch area revealed flagged flooring and pathway and the outline of a flowerbed, which when excavated further unearthed earlier walls beneath. At the end of each years excavation an open weekend was held with tours of the site and various related displays. Oldham Amateur Radio Club set up a radio station on site and contacted other radio enthusiasts around the UK and Europe to tell them about the project. The three excavations involved 1058 children and their teachers, 203 adult diggers, 63 other volunteers (guides, welcomers, pottery washing and analysis and over 3000 visitors. Three DVDs documenting all the excavations are available for £5 each from Royton Library. A book detailing the project from 2004 to 2006 has been produced by the Society in conjunction with Manchester University Archaeological Unit. It is available "free of charge" from Royton Library. The "Royton Lives" group have also produced two "Heritage Trails" booklets where people can take various walks around historical areas of Royton. The booklets maps out the trails and gives a brief description of the points of interest. The booklets are available from Royton Library or can be downloaded from the "Heritage Trails" page of this site.